The youth choir Kamēr…, long renowned for its high artistic quality, has also recorded many groundbreaking and noteworthy CDs. Many new compositions have been written especially for them, and their recording output includes collections of such songs such as World Sun Songs (2008), Mēness dziesmas (2012), and Amber Songs (2014). On their latest CD, recorded under the watchful eye of artistic director Jānis Liepiņš and released in 2017, they have chosen to record works by two significant Latvian composers – Georgs Pelēcis and Pēteris Plakidis, on a collection simply entitled Pelēcis / Plakidis. At first glance, it may seem like a curious choice to combine the two composers onto one album. The immediate connection is that both composers were born in 1947 and celebrated their 70th birthdays in 2017. Pelēcis is known for his sacred works, often with Russian Orthodox themes, while the late Plakidis (who passed away in 2017) often composed more secular choir works based on poetry by Latvian authors. However, there is a clear spiritual and emotional element in the works of both composers, which provides for a musical link between the two. One of Plakidis’ most powerful choir works is ‘Tavas saknes tavā zemē’, with poetry by Vizma Belševica. This song was included as part of the closing choral concert of the 2018 Song Festival, and was one of the most memorable and moving moments of the event. The song, with its quiet and slow introduction, which builds to a thunderous crescendo, is a richly emotional work, and, when performed by Kamēr…, this transcendent work receives an equally transcendent performance. Though composed during the Soviet occupation, this song, with its lyrics about taking root in the Latvian land still resonates with listeners today. Though Pelēcis does focus more on Orthodox choral works, his creative output also includes arrangements of Latvian folksongs, but still with a spiritual interpretation, such as the arrangement of ‘Stāvēju, dziedāju’. Though seemingly just a song about singing on a hilltop, Pelēcis’ interpretation is almost hymn-like, like a song of praise for singing itself, giving this folk song a beautiful richness and depth. With its repeated refrain of ‘Viss labais aiziet debesīs’ (All good things fly heavenwards), Plakidis’ ‘In Memoriam’ (lyrics by Latvian poet Broņislava Martuževa) is a weighty and meditative work, and, as its title would indicate, almost requiem-like. The sound of the choir, particularly the appropriately heavenly soprano parts, makes for a memorable rendition of this work. 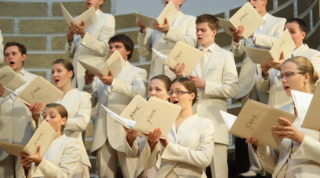 The CD booklet includes brief biographies of the composers and the choir in Latvian and English, but one does wish they delved further into the song selection – why these particular songs were selected for this collection as well as their significance and meaning. 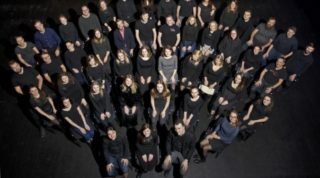 Combining the choral works of Georgs Pelēcis and Pēteris Plakidis on the collection Pelēcis / Plakidis, the youth choir Kamēr… again confirms not only their singing and artistic skill, but also their innate ability to interpret the works of Latvian composers, elevating them and revealing the many spiritual and romantic nuances within them. Still, though, considering the broad and varied oeuvre of both composers, one might have hoped that each had a CD entirely devoted to their works (particularly Plakidis, considering his recent passing and his significant choral music legacy). Conductor and artistic director Jānis Liepiņš (who, at the time of this writing, had recently departed Kamēr… and turned over direction of the choir to Aivis Greters) has overseen an excellent and richly nuanced recording, confirming the significant contributions of both these composers to Latvian choir music. For further information, please visit the youth choir Kamēr… website.